The foundation and development of the "Dimitrie Cantemir" Christian University is one of the most relevant proofs of the efficiency of the private initiative even regarding such a conservative domain as higher education. - Level I: certified Bachelor courses which last for three years, with daily or low attendance for the Economy of Commerce, Tourism and Services specialization. 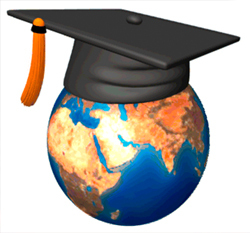 - Level II: certified MASTER studies which last for two years, in the domains of business administration and negotiations, the administration of education institutions and educational management, business management in tourism and commerce and business administration and negotiation. UCDC, accredited by Law no. 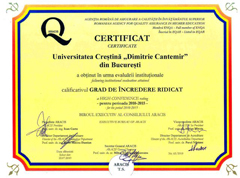 238/2002, is evaluated with High Level of Trust (the highest rating that a Romanian university can obtain) by ARACIS. The Faculty of Touristic and Commercial Management ensures a high education level which offers the students various professional competencies as well as the possibility of being hired as specialists in business administration after their graduation. 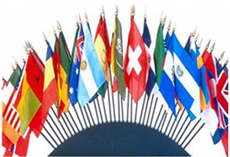 The Faculty of Touristic and Commercial Management cooperates with similar faculties abroad and organizes teaching staff and student exchange as part of the "ERASMUS" program. It has been created on the basis of the current necessities regarding the specialists' formation in business administration. Conference - "Globalization and Competitiveness in Knowledge-Based Economy"